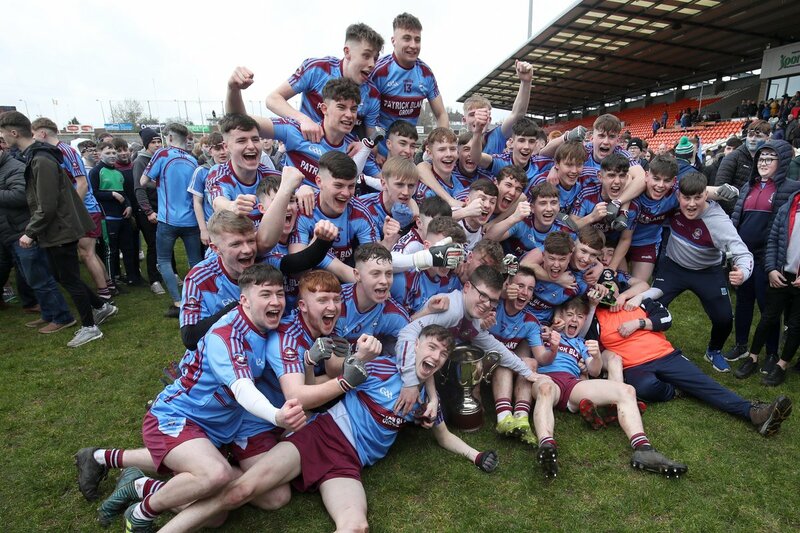 St Michael’s Enniskillen collected the Danske Bank MacRory Cup for the 7th time when they were worthy winners over prematch favourites Omagh CBS at the Athletic Grounds in Armagh yesterday afternoon. In the end four points separated the two sides but the winners were more dominant than that final scoreline would suggest. It was a 5th success for their manager Dominic Corrigan and he was delighted afterwards. “We got a great platform in the middle of the field from early on and we had clinical finishers that made possession count,” he said. The winners dominated the first half with a superb display of attacking football and that was reflected on the score-board as they established a 0-11 to 0-3 lead. During that period Darragh McBrien was a constant thorn in the Omagh CBS defence hitting five points while centre half forward Michael Glynn weighed in with four. It could have been better for the Fermanagh lads had Glynn not put a 13th minute penalty over the bar. It was Glynn who opened the scoring inside 60 seconds before Simon Garrity levelled matters in the 4th minute. McBrien then hit another brace before Omagh replied through full forward Mark Hayes as he cut in from the left wing to fist over. Glynn hit a brilliant score with the outside of his boot before Enniskillen were awarded a penalty. Glynn had been fouled and he took the kick himself but he slipped on the run up to the kick and scooped it over the bar. Daniel Fullerton landed a fine long range free for Omagh CBS but that proved to be their last score of the opening half. McBrien converted a free before hitting an outstanding effort from play after a surging 40 metre run. It was all Enniskillen at this stage with team captain Brandon Horan leading by example in midfield and they added to their haul when a shot from Josh Largo-Ellis bounced over the bar. The superb McBrien took another score with Pol McKervey on target as well before Glynn squeezed the ball over from a tight angle with the last kick of the first half. Omagh CBS needed a good start to the second half and they got it. Substitute Sean McDonagh and corner back Cormac McBride both pointed before Daniel Fullerton converted a 43rd minute penalty after Enniskillen keeper Sean McNally was penalised for a foot block. McDonagh then made it 1-3 without reply and at that stage Omagh were the better side. St Michael’s though didn’t panic and they reasserted themselves. Garvan Quigley and man of the match McBrien both pointed before full forward Conor Love left five between the sides again. McBrien found the range again but with five minutes to go Omagh CBS were right back in contention when McDonagh took a pass from Aodhan McConnell to finish low to the net. It was to be Enniskillen’s day though and McBrien converted a late free for his 8th point of the day as they took the silverware. St Michael’s Enniskillen: S McNally, L Flanagan, G Cavanagh, J Horan, A O’Cathain, J Largo- Ellis (0-1), R McHugh, B Horan, J McDade, C Duffy, M Glynn (0-4, 0-1 pen), D McBrien (0-8, 2F), P McKervey (0-1), C Love (0-1), T Keenan. Omagh CBS: O Grimes, C McBride (0-1), A Fox, R Hollywood, T Donaghy, L McBride, R Kennedy, L Gray, A Montgomery, S Garrity (0-1), D Fullerton (1-1, 1-0 pen, 1F), E Montgomery, R Donnelly, M Hayes (0-1), A McConnell.